Last week’s announcement by European cruise giant, Viking, sent shivers up the collective spines of tourism offices up and down the Mississippi River. The highly successful river-cruising giant will put two cruise vessels on the Mississippi River in 2017, its first North American venture. This adds to the already huge economic impact tourism plays on the Mississippi River. 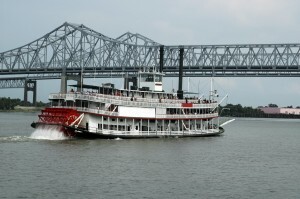 A year-old study of the Economic Profile of the Lower Mississippi River, paid for by the Lower Mississippi River Conservation Committee, showed that outdoor recreation and tourism – two of the nine quantifiable economic sectors the study measured – accounted for over 40 percent of the jobs and over 10 percent of the revenue on the lower river’s economy. The Lower Mississippi River region includes 71,000 square miles and 113 counties in seven states: Illinois, Missouri, Kentucky, Arkansas, Mississippi and Louisiana. The Upper Mississippi River Basin Association is currently conducting a similar study that is likely to parallel these findings or surpass them. Just five years ago, large-scale, overnight Mississippi River cruising was nonexistent. Today two cruise lines offer three-to-seven night cruises complete with on-board historians and accomplished chefs. American Eagle has announced plans to add cruises on the river this year. With Viking adding two new 300-passenger ships in 2017 and four more to follow, tourism on the Mississippi River is exploding. This industry doesn’t sail alone. Its impacts are far reaching for its many stops along the river. Just as cruises in the Caribbean and in Europe bring tourism dollars to home ports and ports along the way, Mississippi River ports and historic destinations will find river tourists a welcome economic contributor. Other Mississippi River tourism is exploding, as well. Bicycle trail use and development, for example, is climbing, and the Mississippi River Trail is expanding to meet the growing demand. A 2005 Wisconsin study of the economic impact of multi-day bike trips found it represented between $3.7 and $6.2 million in revenue and had 2,100 participants in the state. The economic impact of bike trails may be even more exponential because it affects small towns in rural areas. For example, Lanesboro, Minnesota saw its commercial sector swell with 10 bed and breakfasts, 16 hotels and inns, 12 specialty retail shops and 10 restaurants when they decided to focus on the tourism potential of expanding bike trails. These indicators of growing tourist attraction, while welcome, will bring challeges. Infrastructure will need updating. Communities wanting to attract cruise visitors are already lining up with financial packages to make these upgrades. Servicing tourists and visitors – whether coming by boat or bike – is an art form that will need to be learned by local retailers. Local public officials will learn how to juggle the needs of residents with those of visitors. The Army Corps of Engineers will have a new commercial interest making demands on the river’s already frail infrastructure. And, state departments of transportation must seek public and user input to prioritize bike trail development. One thing’s for sure: these announcements and studies validate the mythical attraction the Mississippi River holds for travelers. More efforts will emerge to bring people onto the great river’s shores and banks. But there will be some catches: How will Mississippi River communities manage this new opportunity? How will states capitalize on the economic opportunity of the resource while maintaining its ecological integrity? How will local offices of tourism cash in on an opportunity that’s river wide so it takes better coordination with neighbors? And, where will the workforce – trail managers, hospitality managers, health care and event managers, even marine terminal operators – come from and be trained? Let’s be clear, this is a good challenge. It reflects America’s – and even the world’s – fascination with and appreciation for the great Mississippi River. The challenges represented in this opportunity are real and will take leadership. Will the Mississippi River tourism community be up to them? This entry was posted in Economic, Uncategorized and tagged American Eagle Cruise Lines, Economic Profile of Lower Mississippi River, Lower Mississippi River Conservation Committee, U.S. Army Corps of Engineers, Upper Mississippi River Basin Association, Viking Cruise Lines. Bookmark the permalink.